Better Mining (Lucky Ores) Mod is a new mod that enables you to have many new materials, ores, tools, and armors in your Minecraft world. This mod also adds new ores and helpful tools to develop the mining experience in Minecraft, which halfly makes the game more interesting. Chance Ore randomly drops any material that you can find mining (besides lapis lazuli), but with a 10% chance that it will trigger an almost lethal blow, taking damage from it depends on how far away you are from it. Mystical Ore randomly drops rare or somewhat rare materials. Lucky Ores are an upgrade to vanilla ores. If you’ve seen my old mod, the Lucky Ores mod, then you’ll know what these are. 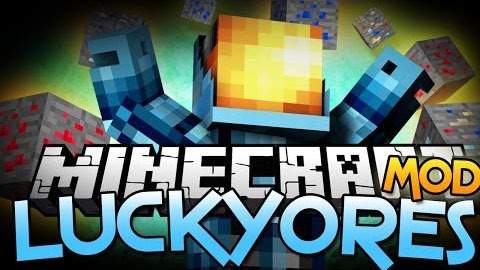 Basically, there is lucky coal ore, lucky iron ore, lucky gold ore, and lucky diamond ore, and when you find these lit up ores, they will drop a small random number of the material you would get. So if you mine lucky iron ore, you will get iron ingots. Ruby Ore and Sapphire Ore drop rubies and sapphires. These can be used to create standard tools and armor. If you’re in a hole and don’t have blocks to nerd pole out, you can get out your trusty grappling hook and right click with it in your hand (when you’re next to a wall) to climb up! With flares in your hotbar, you can fire the flare gun to signal other players! With the miner helmet on your head, you will have infinite nightvision to see in the dark while mining, without needing to place torches!